This weekend marked the beginning of the tenth year we’ve been in Afghanistan. I thought in light of this milestone, reviewing War by Sebastian Junger was probably apropos. First, a little background: Junger, an investigative journalist for Vanity Fair, spent one year in the Korengal Valley in Northern Afghanistan during 2007 and 2008. The Korengal Valley, in his own words, is “six miles long, sparsely populated and of dubious strategic value…the Korengal was the scene of some of the most relentless fighting of the Afghan War.” (LINK) In April 2010, the US pulled out of the Korengal Valley. His newest book, WAR, is Junger’s first person perspective of the five trips he made to the Korengal Valley, where he was embedded with Battle Company, part of the 173rd Airborne. He let’s us know that sometimes the line between “investigative journalist” and “soldier” became very very thin in preparation for battles. And it was pretty obvious that if things got bad enough – and there was no reason they couldn’t – the distinction between journalist and soldier could become irrelevant…The idea that I wouldn’t start helping – or fighting – in that situation was absurd. …but as a journalist the one thing you absolutely could not do was carry a weapon. It would make you a combatant rather than an observer, and you’d lose the right to comment on the war later with any kind of objectivity. War is an incredibly gritty and honest book. Junger does a more than admirable job bringing this nasty little six mile stretch of Afghanistan valley to the reader. There’s a chapter in the first part of the book that really takes the reader on the historical journey of this valley. This section gives a really good description that helps the reader understand the geography of the area, and why it is so difficult to stop the crossings into and from Pakistan; why it would be a natural place for the Taliban to hide; and how difficult it is to actually clean that area up. It certainly isn’t beautiful up there, but the fact that it might be the last place you’ll ever see does give it a kind of glow. As someone who is sitting at my home, one block from the Atlantic Ocean, in beautiful Florida October weather, I’m not sure I can imagine ever writing (or even thinking, for that matter) something like that about any place. And one would think, well, you know, he’s 20 years older than the guys he’s embedded with – its probably just more of a mature view of the world that caused that thought to surface. But, I don’t think so. Throughout the book, Junger relays his conversations with the men of Battle Company. Of the many things discussed, its hard to find any real hope of leaving the valley alive in any of the conversations. It appears that as a soldier, if you went to the Korengal Valley, odds were not with you for going any where else. During his time embedded with Battle Company, Junger did everything the men did. A Humvee that he was in was blown up, his Acheilles tendon got torn; he was in fire fights; and he went through the same long periods of boredom that the soldiers who were waiting to be overrun went through. During those times where nothing was going on (and we learn that the fighting is dependent on partly seasons and mostly how well the crops did because this determines whether the locals had extra money for guns), he planned out the attack to the smallest detail that would kill them all. And he wasn’t the only one planning their demise. Outpost Restrepo, named after a fallen medic, was a place that every single soldier lost a friend. Restrepo dominated the high ground outside the main base. The problem though was the Outpost was exposed in every direction. They slept with their guns loaded, hand grenades beside them; and sometimes when a battle started, they didn’t have time to get fully dressed. That’s the environment Junger and Battle Company was in. That’s the life they were leading. War is not your typical war journal. It doesn’t chronicle the war in Afghanistan; in fact it isn’t written in any kind of chronological order, either. Based on a few articles I read, Junger was trying to understand what courage is. 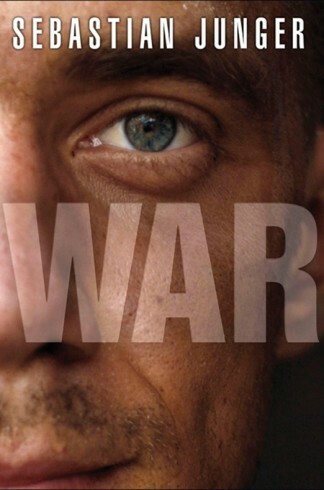 In War, he’s given readers a really impressive look at the aspects of what war is for soldiers in extreme conditions. He cites studies done on combat soldiers, and he cites science done in relation to the brain chemicals. He then compares these impartial studies with what he found during his time with these men. Though he set out to figure out something very specific (what is courage), with War, Junger gives an extreme look at what life is really like for ground combat forces in Afghanistan. Most often, the majority of Americans view this war from their couches watching the evening news on. We get the macro level war – death tolls and politics, but we have no idea what happened to cause a high death toll on one particular day; we only get the most basic of information about what is going on over there in regards to fighting; what the actual geographic challenges are, what living in remote areas is like, how hard it is to keep a base or outpost secure in some areas of the country – hell, for most of us, Kandahar is the only city we know and there’s no relative coorelations about even where that is in the country. Junger changes this with War. Specific thoughts: Afghanistan is almost a mythical place for most civilian Americans. I can’t begin to understand the culture, the economics of the country, or what this war has evolved into ten years later – is it the same as it was in the beginning? has anything changed? How is our secret little war in Pakistan having any affect? And well, why are we sending drones (now helicopters) into Pakistan and dropping bombs without too much public oversight? After reading War, I have a better understanding of the geography, the historical, cultural and economic challenges; and while I can’t say I understand entirely what this war is about ten years later, I do understand some of the nuances that make this war so difficult. But most importantly, I understand much better what it must really be like for the soldiers who are battling in Afghanistan (or any ground war) – at least as much as I can understand. Junger does a really great job of showing the reader what these guys are doing, how they are thinking and how the bonds of combat develop (note: ‘bonds of combat’ has many different meanings). War by Sebastian Junger is a must read. Its not your grandmother’s war journal. Its easy to read, and it makes sense. I thought he did an admirable job taking a topic that is so incredibly hard to understand and writing about it in a way that anyone can grasp. Afghanistan has never really been in the forefront of American politics and foreign policy has it is now; but we still hear nothing about the what the soldiers think, and what they are dealing wtih. It would behoove everyone to read this book – even if we aren’t physically in the Korengal Valley anymore. One last note: The Men of Battle Company and specifically the ones in this book from Outpost Restrepo are some of the most courageous men in the world. War is a big and sprawling word that brings a lot of human suffering into the conversation, but combat is a different matter. Combat is the smaller game that young men fall in love with, and any solution to the human problem of war will have to take into account the psyches of these young men. For some reason there is a profound and mysterious gratification to the reciprocal agreement to protect another person with your life, and combat is virtually the only situation in which that happens regularly. Combat fog obscures your fate – obscures when and where you might die – and from that unknown is born a desperate bond between the men. That bond is the core experience of combat and the only thing you can absolutely count on. …the shared commitment to safeguard one another’s lives is unnegotiable and only deepens with time. The willingness to die for another person is a form of love that even religions fail to inspire, and the experience of it changes a person profoundly. Courage was love. in war, neither could exist without the other, and that in a sense they were just different ways of saying the same thing. Neither of these quotes by themselves give the reasons, specifically, why these men are courageous. Sebastian Junger’s book as a whole gives the reasons why they are. He told the story of these men from his point of view, intimately and wholly. He first reported from Afghanistan in 1996 and, four years later, was one of the last Westerners to accompany legendary guerrilla fighter Ahmed Shah Massoud (while reporting for National Geographic) during his war against the Taliban. Junger has reported for Vanity Fair Magazine from many war zones across the world: he was trapped in Monrovia during the Liberian civil war in 2003, caught in Sierra Leone during the civil war of 2000, and briefly held by “oil rebels” in the Niger Delta in 2006. His October, 1999 article in Vanity Fair, “The Forensics of War,” won a National Magazine Award for Reporting. He has also won an Alfred I. duPont Broadcast Award for his cinematography while embedded with American soldiers for ABC News.